WELCOME to the Hole in the Wall! The Hole in the Wall is one of Austin’s most legendary venues for all the right reasons: we love our regulars, we book incredible live music, our staff is family, and we’re committed to our community. Founded in 1974, the Hole in the Wall sits just across the street from the building on the University of Texas campus where the Austin City Limits show was taped for decades and where KUTX radio still broadcasts. Local success stories Spoon, The Gourds, Shakey Graves, Timbuk 3, Bob Schneider, Fastball, Black Joe Lewis & Gary Clark Jr have all gone on to wider acclaim after honing their chops on the cozy stage in the front window of the Hole. In recent years, touring acts like Old 97s, Mother Hips, John Doe and Jonathan Richman have graced the larger, more professionally-equipped stage in the middle of the venue. Stop by the club on any afternoon, and before you are one drink in, you can easily find someone who will regale you with a mind-blowing musical story. Like the time Stevie Ray Vaughan sat in with Bill Carter and the Blame, wailing guitar until 3am, while Vaughan’s limo waited out front collecting parking tickets, and to win $100 bet, a customer dove through the limo’s sunroof. Pete Thomas of The Attractions once sat in with the band until way past last call, quitting only when a feisty waitress finally said, “Hey, drummer-boy! Time to go home!” Ryan Adams somehow silenced a packed house of rowdy festival-goers with an intimate solo set. Johnny Cash producer Cowboy Jack Clement played a showcase with top Nashville session musicians. Andrew Bird worked his magic as Ani DiFranco admired from the audience. David Byrne danced at a disco-themed hoot night. Spoon shot the video for their song “Jealousy” in the men’s room. 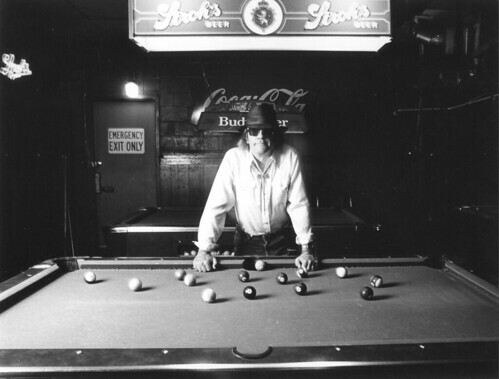 Townes Van Zandt and Blaze Foley spent many a night under the pool tables after club crawls down Guadalupe Street. On separate occasions, Courtney Love and Dave Grohl—either tagging walls, cleaning beer off their heads, or otherwise—spent longer than appropriate amounts of time in the men’s room. Fastball and some of their fans chased a guitar thief around the corner and trapped him in a nearby alley. Don Henley of the Eagles walked in one night just in time to sing background vocals with Mojo Nixon on his classic MTV single “Don Henley Must Die.” Lucinda Williams, Nanci Griffith, and Lyle Lovett played for tips in their early days. Beaver Nelson proposed to his wife from the stage. Little known to many, cult legend songwriter Willis Alan Ramsey‘s first and only album was recorded in the vacant space in the early 70s before the club opened. The Velvet Underground‘s Sterling Morrison was a weekly resident guitarist in the late 70s. REM once stopped by to jam and take sidewalk snapshots under the most recognizable marquee this side of Vegas. St. Vincent played a solo set amidst a tangle of misfiring effects pedals. Emmylou Harris ate popcorn at the bar before harmonizing with Rosie Flores onstage. Natalie Portman shot a few serious games of pool. Quentin Tarantino heckled the band with obscure requests. John Stamos played some decent drums at a free-for-all Sunday night jam. Drew Barrymore and that “I’m a Mac” guy got close at a beat-up picnic table in the former shotgun alley turned beer garden. Psychedelic Furs played pinball. Leonard Cohen enjoyed a cheeseburger and watched the co-eds walk by from a table on the front stage. Jenny Lewis played her Austin debut on a Sunday night with her former band Rilo Kiley. The Texas Tornados played the front room stage in 1990 to celebrate the release of their debut album, and midway through their set DJ Fontana and the late Scotty Moore, the drummer and guitarist of Elvis Presley’s original band, stopped in and ended up sitting in with the Tornados to end the set. In the early 2010s, some of Austin’s most innovative talent took over Tuesday nights at the Hole in the Wall. Clyde and Clem’s Whiskey Business and The Bread burned down the front stage every week, and Bridge Farmers punctuated bluegrass fury with heavy psych sounds. From Planet Kickass, The Van Buren Boys gave audiences rock n’ roll in a nutshell, and we all watched in awe as Bankrupt and the Borrowers pushed the limits of plastic and wood and brass. They grew into local and international favorites East Cameron Folkcore, who out of tragedy created inspiration, family, and music that Kevin Curtin says “holds up a mirror to society.” We miss you, Jon. After a handful of earnest bar owners, and a couple of near-death experiences with the bottom line, the Hole in the Wall now flourishes in its current era as a live music staple, with 6+ hours of wildly diverse musical acts a day, an energetic staff of dedicated young bar pros, and local vegan heroes Arlo’s serve up delicious veggie hamburgers and comfort food in the back at their first brick-and-mortar location. So stop by whenever you feel like a stiff dose of authentic Austin. A few rounds later, it’s safe to say you might be involved in creating a Hole in the Wall legend of your own. THE HOLE WORLD – Here’s some random video and photos and stuff we threw up here to get started.